My husband, son, dog and I live in Glasgow, Scotland. We are very down to earth and enjoy family life. We have a busy schedule at home and therefore enjoy the complete break when we go to our villa in Lanzarote; we hope you will too. We rented our house from a friend based in Lanzarote and fell in love with it straight away and when we heard it was up for sale we put a bid in immediately. We have never come across, in all of our travels, a sea so safe to swim in (no jelly fish to worry about) but the sea at Puerto Del Carmen is just that and that was the main reason for buying the property. The villa is in close proximity to everything you need while on holiday and there is no need to drive, only to relax. If you want to travel while in Lanzarote the buses are also at the end of the street If you want to go on excursions these too are organised by people situated on the main road at the end of our street. En-suite bathroom to bedroom 1 with bath/shower, wc etc. En-suite to bedroom 2 with bath/shower, wc etc. Additional toilet with wc and shower; this is directly off pool area. Bedding is provided and will be replaced weekly. If guests staying for 10 days wish a change mid-week then there will be a cost for this. There is a small car park for the surrounding villa owners. However, is it typical for cars to be parked in the street outside the villa. Large spacious living room with a 2 three seater leather sofas, glass topped wicker dining table and chairs, coffee table, TV/DVD with satellite channels, music system and book shelf. Equipped enough to cook at home. Fully equipped kitchen consists of oven, hob, dishwasher, washing machine, microwave and fridge/freezer. There is a table in the large living room where people can dine. Also there is the option of eating at the table in the patio area. Satelitte package showing mainly British and American channels. There is a bookshelf with a small collection of books. We have a decent sized patio area complete with sunbeds and parasols. We would ask guests not to take glass onto the patio. Wheelchairs are accessible from the front door and there are double doors leading out to the patio which can be opened. Although there is a bedroom downstairs everything else is accessible from the upper level. This is heated all year round. It is cleaned weekly. Notes on accommodation: The villa is equipped with iron, ironing board, free standing fans and hair dryer. We thank guests for not smoking inside the villa. Please note that bookings are not available for hen or stag parties. Please note that the villa is not suitable for children under school age. The villa is on 2 levels with a double bedroom in the lower part of the villa. Outside: Patio doors lead from the living room onto terrace where you can enjoy the Chimera (for cooking pizzas outside) and dining facilities and immediate sea views. Side door of living room leads directly onto private heated pool area where sun loungers and parasols are provided. We ask guests when outside to be aware that the villa is in a residential area and therefore to be aware of our neighbours. Cleaning / Towels / Linen / Maid service: A maid service is provided once per week. Bedlinen is changed weekly for bookings for 2 weeks or longer. For guests staying 10 days, a change of bedlinen and maid service can be arranged at a charge. It was not clean, several things were to old or broken, the cutlery was very minimal. The property is in a great location. Only 1 minute walk to the beach, shops and restaurant and stil in a quiet street. It is spacious and the beds slept good. The mattresses are renewed recently and looked still reasonable clean but unfortunately there were no matras covers between matras and sheets, because of the thin sheets you can wait it will be dirty in short time. The blankets were not really clean. It felt no good to sleep in such a bed you don't know who has slept there before :(. We cleaned the terras floor outside ourselves because we got black feet when walking barefeet. After the cleaning it also looked a lot better. We used the water from the swimming pool because there is glorix in. No cleaning material available. The pump of the pool makes a lot of noise so sitting quiet on the terras is not possible. That is annoying. There is one bathroom renewed and looked nice but the other bathrooms were old, there were several tiles loose. That looks dirty and makes it impossible for the cleaning lady to clean proper. The dishwasher was old, dirty on the outside and very loud. The oven was not cleaned inside. The floors in the basement were not clean and the bathroom is old and looked dirty with al rusty stripes in the bath. The bath did not really welcome you to use. Yak. The armature for shower needed to be replaced or repaired and the window fell open all the time because the lock was broken. There was a door from the basement for a way out on the street. It had an extra steel bar door as entrance protection. This could not be used because it was locked. This was also an emergency exit. Anyway, the way out was used as toilet and full with rubish and nobody cleaned this so who would want to use this way out anyway. The kitchen was old, we bought some cutlery ourselves. You need to let the dishwasher run twice a day because of the minimum of knives and forks. We tried to clean a little ourselves but there was not really stuff to clean with except an old dirty mop. Not a drop of soap or multi purpose cleaner in the house. Further several things looked old, were broken or did'nt work as it should. We don't mind when interior is dated but we expect it to be clean We sent an email to Fam. Hamilton after 3 days because maybe they don't know about this all, but got no reaction. That is annoying. Conclusion, the villa is in a super location but needs a recovery and good cleaning. We would not hire it again as long as it is in this condition. This guest contacted me prior to this review and I asked her if she had brought any of these points to the attention of the management company and I did not receive a response from her. I cannot stress enough how important it is for my guests to contact the management company if they have any complaints while they are 'in resort'; if this is not done then the issue cannot be resolved and this includes any issue to do with cleaning as we pay our management company to provide this service. By following this practice the guests are putting the issue(s) "on the books". The guest also mentions no mattress covers but again this would have been resolved by contacting the management company. Likewise for the downstairs bathroom. The dishwasher works. The pool heater is a necessity so that the pool is warm. The door in the downstairs bedroom is a firedoor only and not an exit door to the street, there is a key behind a glass cover. We would not advise any guest to use the swimming pool water to clean the patio, as this may affect the balance of the swimming pool minerals and the level of the water in the pool and will adversely affect the following guests coming in. As far as providing cleaning materials we are following standard practices of management companies that we have dealt with over the last 20 years. Shops selling cleaning materials are minutes away from the house. The guest said that I did not respond to a personal email to me. The guest has since admitted by email to me that she used the wrong email address; it is disappointing that she has not admitted this in her review, stating only that she 'got no reaction'. It was disappointing that she failed to mention positives like free wifi, a satellite TV pack and a heated pool. ideal location convenient to seafront but villa in serious need of upgrade both inside and outside. photos on website somewhat misleading . We are pleased that the guest enjoyed the location of the house. However, we must disagree with the guests personal view; the house is not marketed as a luxury villa, rather as a house with many amenities, and which is regularly upgraded. I have stayed at this villa many times, i love staying here. Over the years i have seen how people have mistreated the Villa and left it filthy, when i arrived early before the cleaners had finished cleaning. The Villa has been painted inside and out recently, and had the electrics renewed. Had new sofas, blinds and curtains, new bed downstairs. As for cushions on chairs if you look at other villas they don't have them or even hotels. I am Disabled and also found it uncomfortable for my back, so I just went and bought two lounge cushions from shops on Sea front for 5.99 Euro. Easy. Instead of moaning about the toilet did you let maintenance know, they would have sorted it out. If they did not fix the problem, then ring Linda instead. Fantastic Location. Quiet,easy acessible for all amenties. Fridge in an annoying place very diffcult to open. Cleanliness all round poor, we cleaned the fridge ourselves on arrival. The dining room table, needs a good disinfectant,(food and dirt under the glass) better still replace it !! Sleeps 8. Only 7 sunbeds, No cushions ,they are uncomfortable with just a towel, not what you want for relaxing. Its not all negative, just a small amount spent on it. And it would be perfect. Outside is enough, pool was clean and warm. We would go back, with its update and refreshment. Wouldn't say it was ideal for very young children. Thank you for your review. We are glad that you enjoyed the stay enough to want to go back. Your comments are helpful and will assist us in liaising with our management company with the relevant points and we will endeavour to sort out the various issues you have raised, which you have indicated are fairly easily rectified. You make a good point that the villa is not suitable for children; this is already on our webiste. Just back from 2 weeks stay at Villa Folias with my partner & our 2 children. Overall the villa is great & is in an excellent location situated very close to the bars & restaurants that are also opposite the beach. The 3 ground level bedrooms are a decent size and the ground level bathroom has a large walk in shower which was great & Jack & Jill doors for access from both sides. The lounge diner is a really generous size and I can imagine would easily accommodate 8 without feeling like you were on top of each other. It has a decent size TV which seems to have every satellite channel & more besides so good for occupying the kids if they want some time out of the Sun. 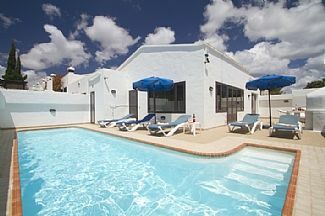 There is also a toilet off the hallway with a shower cubicle & door leading to the pool area which is really convenient when ur in & around the pool which by the way is a great place to relax as it gets the hot Lanzarote Sun all day & the pool is great for cooling off. The kitchen area isn’t as generous but plenty big enough for what u need on holiday. It’s well equipped with fridge freezer, microwave, hob, dishwasher & washing machine. We did however have a problem with the washing machine at the end of first week when we tried to wash a few things which we reported to the owner & they were waiting on someone coming out to repair/fix it so hopefully it will be resolved soon. The 4th bedroom situated down a flight of stairs from the kitchen was also a decent size but didn’t have a lot of natural light as there were fly screens over the bedroom windows which couldn’t be opened & a solid locked door that leads into a small side street which also can’t be opened, I’m guessing for security reasons so most of the light came from the ensuite bathroom window. The ensuite had a shower over the bath which worked ok but wasn’t as new or effective as the upstairs walk in shower & due to the low ceiling isn’t great for anyone who is tall (6ft or over) as your not able to stand under the shower so not ideal but still manageable. There is a welcome booklet on arrival & everything you need to know about the villa is in there with useful phone numbers & other general information. I would definitely book this villa again & would recommend it to anyone looking for a relaxing self catering holiday in Puerto Del Carmen. The main beach in Puerto Del Carmen is 150 yards from the villa. All you have to do is walk down to the bottom of the street, cross the road and you are immediately at the beach. Airport Arrecife is a 20 minutes taxi journey. The supermarket is 150 yards from the villa. A wide selection of restaurants and bars are also 150 yards from the villa. Booking Notes: 20% deposit payable within 7 days of booking and remainder to be paid six weeks prior to booking. In the event of last minute bookings whole amount is immediately payable. We require the names and ages of all guests. Please note that the villa is not suitable for children under school age. 2016/7 prices are £725 per week low season; £775 for Mid Season and £825 for High Season. Please note NO 10 day bookings in July or August. Changeover Day: The preferred day is Thursday but this is flexible. Normal check out time is 10am and check in time is 2pm. For guests arriving early or departing late check for access or staying on at the villa. Notes on prices: Prices for the villa are based on four people sharing, additional guests are charged at £13.50 per person per night. A 20% deposit of the total price is payable immediately with the remainder payable six weeks before the booking date. Please note NO 10 day bookings in July or August.